The Leven wedding stationery range is a traditional design with a contemporary twist featuring a stunning mirror tile hand-painted with a silver heart which is mounted on your choice of pearlescent or textured cards. 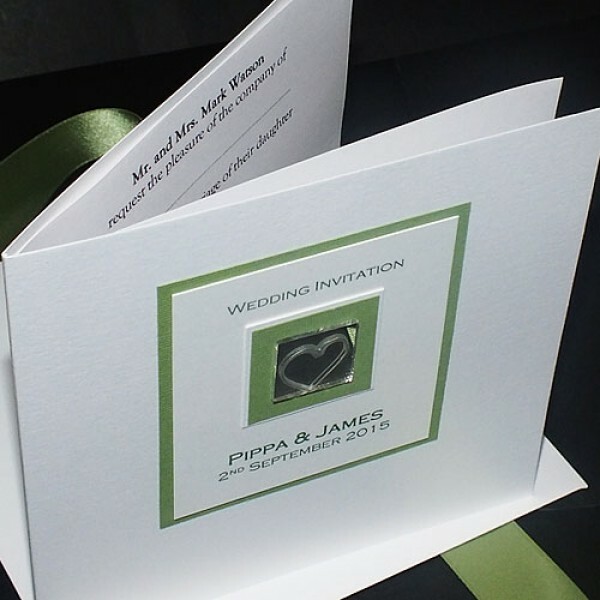 On each wedding invitation, the names of the bride and groom and the wedding date are printed on the front. 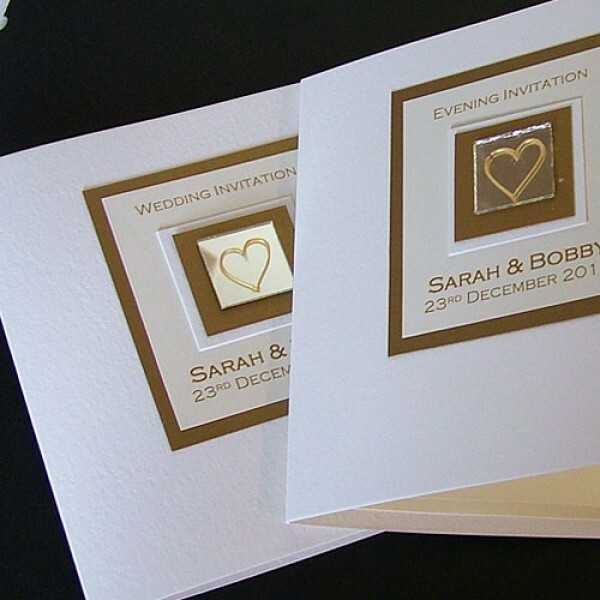 The Leven design is available in any colour scheme to match your wedding and we are happy to match to a colour sample. If you let us know your colour scheme when placing an order for a sample, we will send you a swatch of the card colours available. 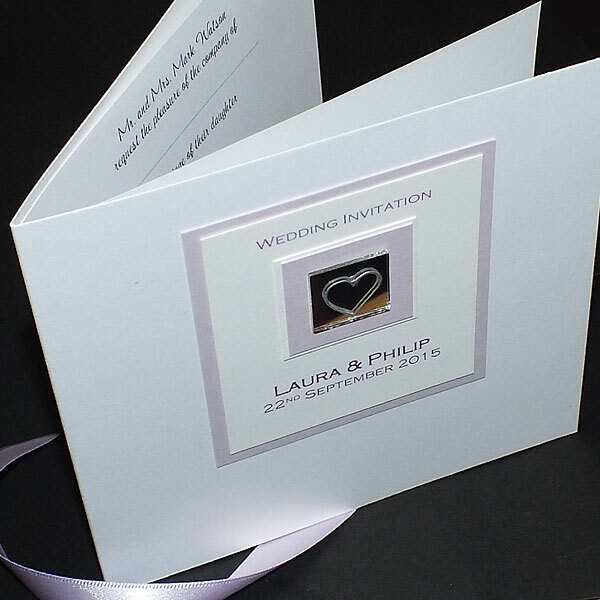 The design shown is square card which is 140 x 140 mm, but you can choose a different size or shape if you prefer. 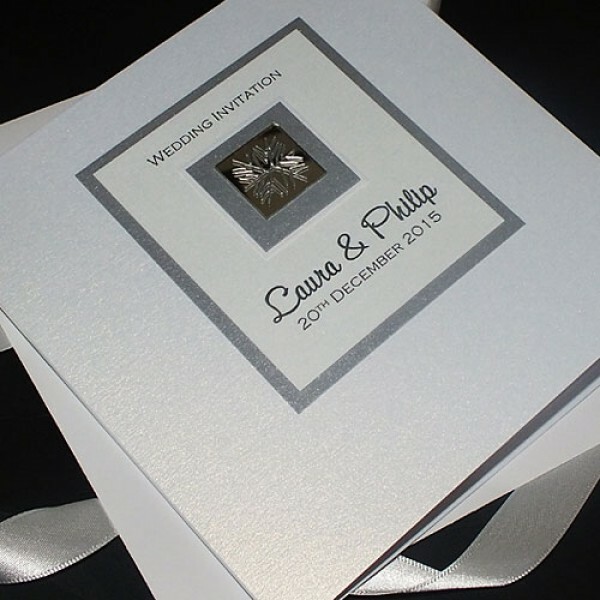 The wedding invitations are printed onto luxurious pearlescent card and are fully personalised with your own choice of wording and fonts. 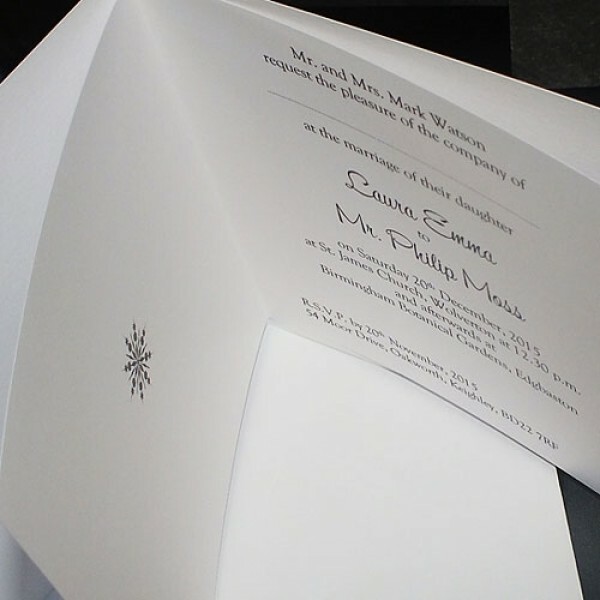 We are happy to advise on the layout and presentation of all text inside your invitations. 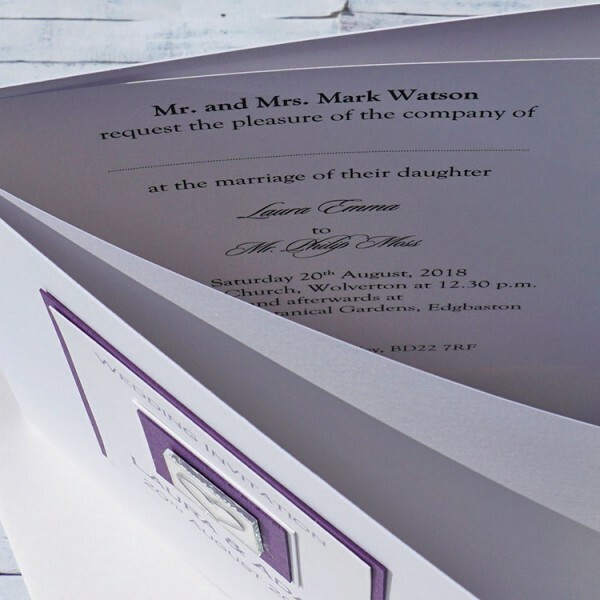 If required, coordinating reply cards and information / gift list cards can be made to match your chosen colours and fonts and will be designed to fit inside your chosen wedding invite. 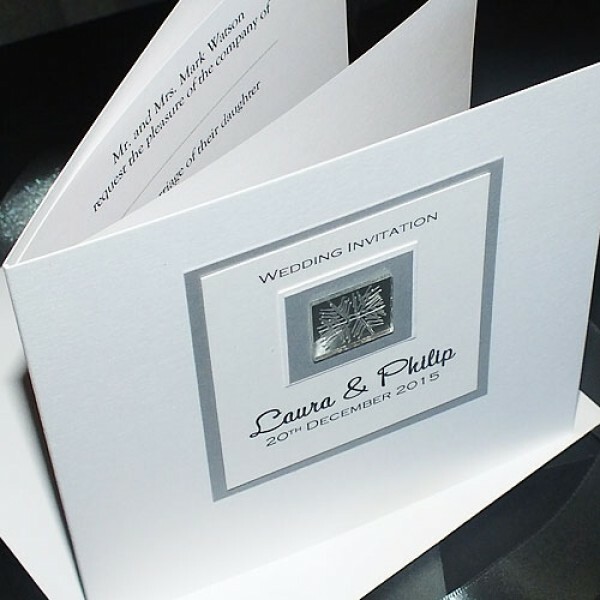 The design is easily adapted for a Christmas Wedding as shown with the silver snowflake invite design in the photos. 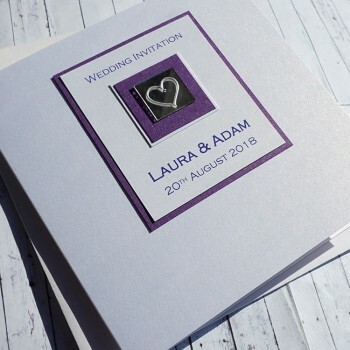 Personalised wedding guest book in a design to match the LEVEN wedding stationery range • FREE p..
Leven Personalised Wedding Photo Album Personalised photo album to match the LEVEN Weddi.. 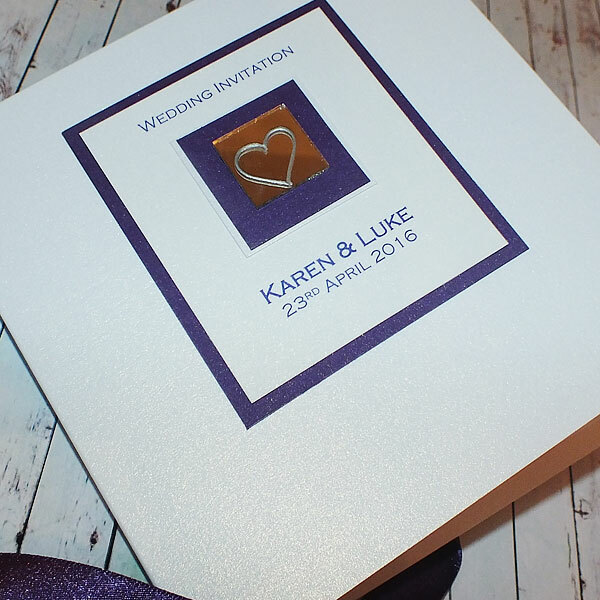 Handmade wedding favour boxes The 'Leven' design features a painted silver (or gold) hea.. Wedding Table Plan to match the "Leven" wedding invitations range The Leven Wedding Table Pla..
Order of the Day Board for Civil Ceremonies or Civil Partnerships An Order of the Day Board c.. Matching Leven Personalised Reply Cards Designed to match the size, colour and font style of ..
Leven Flat Handmade Wedding Invitation for Day or Evening LEVEN FLAT WEDDING INVITES can..
Leven Design Handmade Wedding Invitations - Pocketfold wedding invitations LEVEN POCKETFOLD I..
Leven Handmade Wedding Order of Service, Order of Ceremony, Order of the Day The LEVEN..
Leven Handmade Wedding Menu To co-ordinate with our Leven wedding invitation range ..
Leven Personalised Place Cards Designed to match the Leven wedding stationery range, these co..
Leven Handmade Table Name or Number Cards These co-ordinating TABLE NAME OR NUMBER CARDS..
Leven Wedding Thank You Card Designed to match the LEVEN wedding invitation range, ..